Last night’s Guilty Gear Xrd REV 2 action at the inaugural Evo Japan was incredible, but it was the lead-up to the final match that really stuck with me. The commentators gave a surprisingly moving speech about the passion and dedication of the fighting game faithful, the culture of the community, and putting soul into every coin. 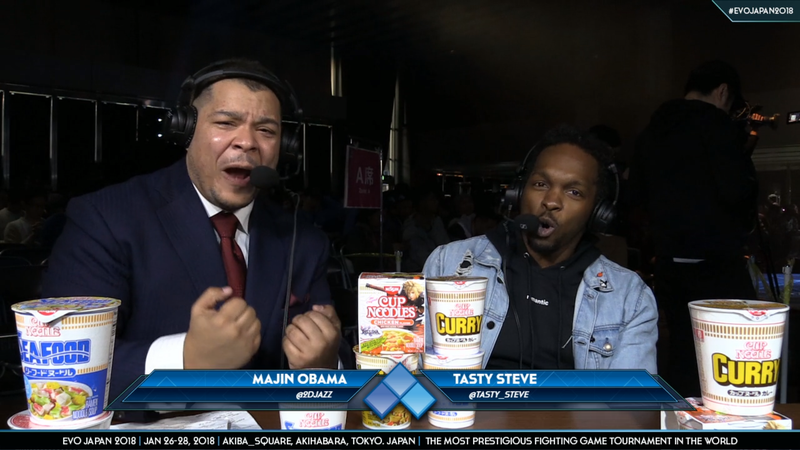 Before the final clash between Nage and Omito, commentators Majin Obama and “Tasty” Steve Scott set up the stakes. Omito, the Evo 2017 champ and leader of the western Japan scene, while Nage hailed from the east and had never had a big stage win. It was a feature-film storyline. As Majin got more into it, he started getting emotional. He gets more impassioned, talking about the passion exemplified by these two fighters and how it transcends games, beyond just Guilty Gear or Tekken. At this point, Majin Obama is speaking with diction and conviction that seems over-the-top. But co-commentator Scott picks up on it and fuels the fire, leaping into my personal favorite part. Okay, a quick note—Mikado is a mecca for Guilty Gear players in Japan, where players will gather to play against some of the best and hone their Xrd skills. “When you have to dig into your lunch money for another shot at that guy on the other side of that cab,” said Majin Obama. This exchange led right into the start of the finals perfectly, and by the end, I was about ready to pack up and make a pilgrimage to Mikado. And I don’t even play Guilty Gear. The finals were spectacular, by the way, with a bracket reset from Omito leading to a tense best-of-five between two of the game’s best, packed with plenty of commentary from these two impassioned public speakers. Next time I need a boost in the morning, or if I’m having a tough time in online matches in Dragonball FighterZ, or maybe when I’m figuring out which detergent to buy at the store, I will reflect on the weight of the coin.